Eliminating acoustic defects such as echoes and flutter echoes. Maximising the loudness in the audience. Minimising the background noise level in the room. Speech intelligibility can be measured by the ‘Speech Transmission Index’, a percentage between 0% and 100%. BB93 requires that areas designed for speech should achieve ‘good’ speech intelligibility, corresponding to an STI of at least 60% across all areas of the audience. Reverberation time is not only important for speech, but also important for audio visual presentations, as well as for amplified speech. For example if a film or a music track is being played from the AV system it is desirable to have a low reverberation time to ensure that amplified sound is clean and intelligible by reducing the build up of reverberant noise that can muddy the sound. This is seen clearly in spaces such as cinemas, which are heavily treated with absorptive material. In order to accurately construct the model, MACH Acoustics carried out tests to determine the current levels of speech intelligibility across all areas of seating. 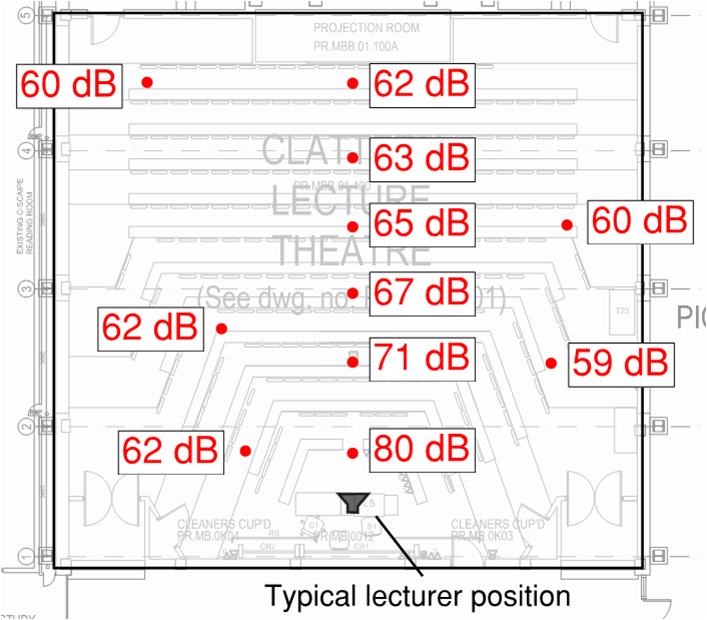 Sound pressure levels were measured at various points around the room with a loud speaker playing in the position of a lecturer. The results are shown below. To put this into context, a 10 dB difference is usually perceived by the human hearing as a doubling in loudness. The results show that levels in the wider areas, even when at a comparable distance to a position in the centre of the room are significantly lower. Levels at the back of the room are very similar to those as wide seating positions in the first few rows. This occurs mainly for two reasons. The seating arrangement spreads wide from where the lecturer would typically be stood. Hence the lecturer must constantly turn to address different sections of the audience in order to be heard. Consequently when he or she is facing towards one side of the room, the level heard on the other side of the room is lower. MACH would usually advise that a seating arrangement is a) in front of the speaker and b) has an angle from the speaker to the widest seating position that does not exceed 30○ (currently as much as 70-80○). The front portion of the ceiling is angled and reflective. MACH would usually advise this type of arrangement, as it aids in reinforcing sound levels towards the rear of the theatre by angling early sound reflections towards the back (as illustrated below). Hence as in this case, the sound is more evenly distributed across the majority of the audience behind the first few rows. This can be achieved by a sloped ceiling as in this case, or by suspending angled reflective panels (available in a range of aesthetically pleasing designs) above the area where the lecturer would usually stand. An acoustic model was created, based upon the test data. 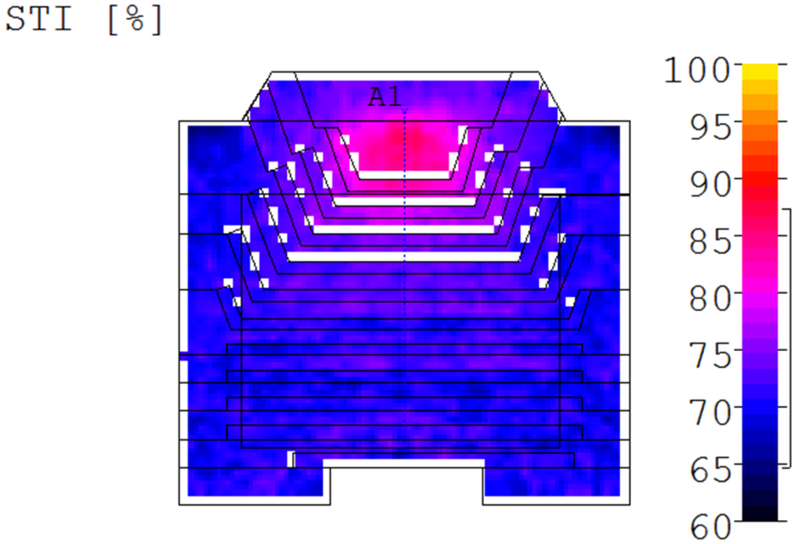 The model allows us to assess the space by estimating the reverberation time and the spread of sound across the space, as well as the ‘Speech Transmission Index’ (STI) for speech intelligibility. Ideally MACH Acoustics will usually target an STI of at least 65%, ‘ideal’ speech intelligibility and it can be seen that this was the case in all areas of the theatre. The reverberation time in the existing space is on the high side for amplified AV presentations. It was therefore deemed desirable to reduce this in the design of the refurbished theatre. Using the model, MACH Acoustics developed a number of design options for Kingston University, providing varying levels of acoustic treatment to reduce the reverberation time and allow for better travel of speech within the space. All options offered reduced reverberation time from 0.7s to 0.5s and under, with increased STI at back and room edges.Whilst MACH Acoustics had a recommended best options, the various methods allowed the client to select the best design style for the build.